On #WorldOtterDay we thought we would share a summary of some of the work that the Somerset Otter group has going on. This prompted by the excellent Cardiff University otter autopsy. As part of the Somerset Otter Group’s research and population studies we record otter deaths in the county, and wherever possible dead otters are collected for autopsy, providing a very valuable insight into the health and status of the otter in Somerset, and also allowing for mitigation measures to be taken at sites where otters are frequently killed on roads. In the 1990’s James Williams persuaded the Environment Agency to include Somerset Otters in the post mortem contract with wildlife veterinarian Vic Simpson at The Wildlife Veterinary Investigation Centre in Cornwall. 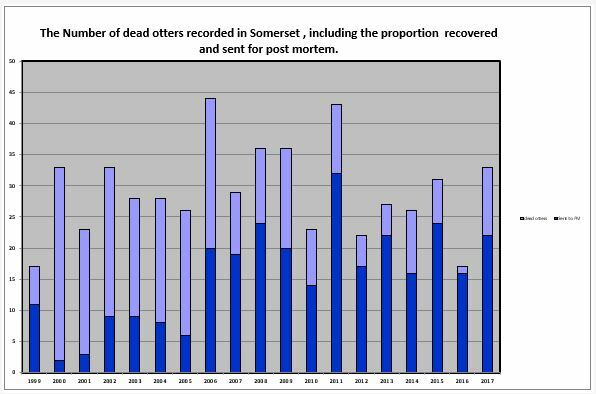 From 1999 to 2007, 74 dead otters from Somerset were examined by Vic. In 2006 the fluke Pseudamphistomum truncatum was discovered in an otter from the Somerset Levels. In 2007, the Cardiff University Otter Project took over the post mortems and since then 220 of the 326 recorded Somerset dead otters have been collected for the Cardiff project – a 67% recovery rate. So far in 2018 there have been 7 deaths recorded in Somerset, 6 of which have been recovered.